White Dalton Motorcycle Solicitors understand there are many similarities between motorcyclists and cyclists with the problems they face on the road. We offer legal assistance to cyclists looking to commence a cycle accident claims if you have been knocked off your bike. Cycle traffic has been on a gradual increase over the years with more and more road users taking to cycling to work and leisure cycling, whether on a road bike or mountain bike. In comparison to motorcycles, cyclists cannot move off very quickly, at roundabouts for example. Between 2009 and 2013, 15 per cent of pedal cyclist KSI casualties occurred as a result of the motor vehicle involved in the accident moving off as the pedal cyclist was going ahead at a roundabout. Cyclists accounted for 11% of all road casualties in 2013. Between 2009 and 2013, 30 per cent of pedal cyclists killed or seriously injured at crossroads and staggered T-junctions – places where several roads meet a main road at a slight distance apart – happened as a result of the cyclist ‘going ahead’ and the other motor vehicle involved turning right or turning left and 20 per cent were as a result of both the cyclist and the other vehicle ‘going ahead’. Junctions and roundabouts are an additional hazard for cyclists. Between 2009 and 2013 approximately 80 per cent of cyclists killed or seriously injured occurred at roundabouts and away from junctions as a result of both the cyclist and the motor vehicle ‘going ahead’. Cyclists are also easily affected by side winds when being overtaken, in the last five years 13 per cent of pedal cyclist KSIs that occurred away from junctions was as a result of the cyclist being overtaken by a motor vehicle. It can be helpful to compare bike accident statistics with motorcyclists, another vulnerable road user group. Motorcyclists are also vulnerable at staggered T-junctions and areas away from junctions. Similar to cyclists, motorcyclists are also difficult to see at junctions however unlike cyclists, motorcyclists tend to move more quickly and are often killed or seriously injured when motor vehicles pull out at junctions. Given that around 70 per cent of cycle traffic is on urban roads, it is unsurprising that the majority of cyclist casualties occur here (60 per cent of all pedal cyclist casualties in 2013) in comparison to rural roads. As well as the majority of cycling taking place on these types of roads, there is a greater chance for cycle accidents to occur due to the increased interaction between cyclists and other road users. In contrast, though, despite carrying only 30 per cent of cycle traffic, over half (58 per cent) of pedal cyclist fatalities in 2013 occurred on rural roads. Therefore accidents that occur on rural roads tend to be of a more serious nature than those on urban roads. The obvious reason for this difference relates to traffic speed. Urban roads have a much lower average speed than rural roads and it is this speed that causes the worse outcomes for cyclists. Again, motorcyclists can provide a useful comparison. Similarly the majority of motorcyclist casualties (65 per cent) also occur on urban roads and the majority of motorcyclist fatalities (70 per cent) occur on rural roads. Emotions can run high after being knocked off your bicycle. The calmer you are the better chance you have of making sure that the necessary information is collected at the scene of the accident. This evidence will help when you start a cycle accident compensation claim. If serious injuries have been sustained get medical attention. Both of these actions will help with evidence later on should you start a cycle accident compensation claim as the Police will have written a Police Report, and your injuries will have been recorded by the Hospital or by your GP. And drivers licence numbers of the other parties involved – Also collect the names, addresses and telephone numbers of the other motorists involved. If there are witnesses, it will be beneficial to collect their contact details as well as they will be able to corroborate the circumstances leading up to the accident. If you have a smartphone with you or there is someone available to, take photos of the accident scene, including any damage done to vehicles. Photographing things like skid marks and damaged road furniture / signage will also form part of the evidence when you commence a personal injury claim following a cycle accident. Why do cycle accidents happen? The most common contributory factor assigned to pedal cyclists and other vehicles was ‘failed to look properly’. This is commonly referred to as the ‘looked but failed to see’ problem in road safety literature or SMIDSY (Sorry Mate I Didn’t See You). This may be particularly common where pedal cycles and motorcycles are concerned as they are smaller and easier for motorists to miss when looking around the road. In 2013, 23 per cent of pedal cyclists involved in accidents ‘failed to look properly’ whereas half of other vehicles involved in accidents also failed to look properly. The second most common contributory factor assigned to both pedal cyclists and other vehicles was ‘failed to judge other person’s path or speed’. In 2013, 17 per cent of other vehicles involved in accidents failed to judge other person’s path or speed, in comparison to only 10 per cent of pedal cyclists. In order to commence a claim against a highway authority for a defective road surface causing a cycle accident you need to be able to prove that the highway surface was so defective that it presented a real danger to traffic that might use the road. Roads are inspected fairly regularly by Highways inspectors, but very often they have no experience of or thought for cycle traffic. Most highway authorities argue that as long as they have inspected the road they have a complete defence even if the road surface was defective. Only specialist knowledge can give you a realistic case against this. Loose chippings that accumulate on the surface of a road are a hazard to cyclists and present a very real risk of the bike sliding away underneath you. 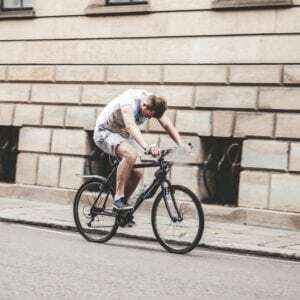 If you have come off your bicycle on gravel chippings from the road then we will need to get photographic evidence quickly when starting a cycle accident claim. In the majority of cycle accidents claims the third party driver and vehicle details are obtained, however depending on the severity of injuries sustained it may not be possible for a cyclist to obtain details of the other party, instead having to rely on either witnesses or the Police statement at the road side. In some cases, vehicles involved in bicycle accidents fail to stop. This means there is no identifiable third party to claim against. In these cases an application can be made to an organisation called the Motor Insurers Bureau (MIB) which is specifically in-place to compensate road users where the third party is untraced or uninsured. If you have been involved in a hit and run cycle accident, report your accident to the Police immediately and it is helpful if you have witnesses who will be able to corroborate the events that led up to the cycle accident and the fact the motorists left the scene of the cycle accident without stopping. If you have suffered injuries from the cycle accident, the MIB will consider any medical evidence submitted as well as other documentary evidence in support of your cycle accident claim and decide if compensation is appropriate in this case. If you have been involved in a cycle accident on the road, call us immediately to speak with one of our solicitors who will discuss the events that led up to your accident, any damage to your bike and any injuries you might have sustained. They will then provide you with answers as to the next steps in starting a cycle accident claim. The law surrounding single track vehicles be it motorcycles or cycles is much the same and we are able to advise on cycle accident claims.